Looks like it's another good book to have in your collection especially if you're a MOTU enthusiast like I am... Now I'm actually more intrigued to read about the creatures, the locations, the vehicles and artifacts and weaponry utilized in this universe than the characters themselves! It's a must have. I'm just sorry that I don't see any input from Emiliano. I can only imagine how much richer this book would be with his input. So it looks like they haven't used any photos of the Vintage figures to introduce characters, only Classics. That my friends, is what you call SUPER LAME! What a glaring oversight. I noticed they had a vintage for Bow and Flutterina, but only because they had the Classics too.... why not use some pics of Vintage figures? Good grief, they are what started it all. Yet another bone headed move in the world of MOTU! They probably used Classics, because that line got to a greater majority of the characters from all of these different lines. Classics reaches from Vintage to 200X while keeping the same dimensions and basic look--unifying Vintage (squat bodybuilders), POP (girly figures), NA (g.i. joe-like) and 200X's (hyper-anime) varying looks and designs, while bringing forth a legion of MOTU characters that any of those lines never reached. An interesting question I have is...where can they go next? A MOTU guide that focuses on the Mike Young Production cartoon? Or a DIC New Adventures Guide Book? Collecting the UK comics? The 1987 movie? The 1987 movie would probably be tricky, because of the rights issues. My guess for the next book would be 200x (Mike Young Productions). A book (or books) about the 200X/MYP and the NA series indeed would be awesome to have, especially if they include some post art work and stories of the episodes that never made it in the cartoons. I just opened up my copy, and yes indeed, its another big sized heavy book as expected from the video linked in the original post! The printed paper somehow has a decent quality to it but I find it a little thinner than the other DarkHorse books to save on weight, size and cost I believe, otherwise the 700 pages would've been too much for just one volume! Most of the art work used in this guide is in the 80's vintage style, so it takes you back in that fantasy era once you start browsing through it. 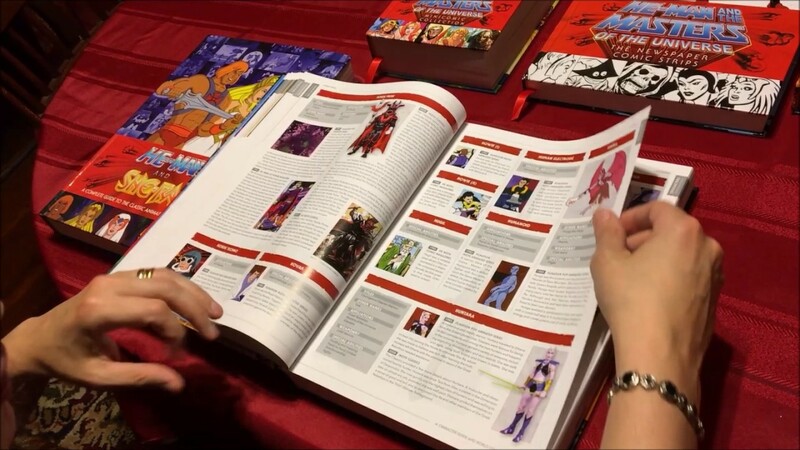 It's very thorough from the first glance at it, and it will take you sometime to go through and enjoy all the material and references in it. Probably my only nitpick at this point is the text, it's somehow finer and smaller what I'm used these days, I guess I got a bit too spoiled from looking at the digital screens through out my daily routine, plus most of the books and magazines I tend to collect or read have a bolder or a larger text. So I might end up getting the digital version soon, my large iPad pro has become my most convenient tool to carry around, from home to work. So if you don't wanna spend the extra money or worry about the considerable extra weight of the hardcopy, you probably should consider the digital version especially if you happen to have a decent tablet in you position... All in all, it's a wonderful nostalgic book to enjoy for years to come.